I loved Douglas Adams’ line from The Hitchhiker’s Guide to the Galaxy: “The ships hung in the sky in much the same way that bricks don’t”, and I can remember being convulsed with laughter when I first heard it. A quote often heard in our household is “I do not like to leave you all along” which was a misprint in a book we read to our young daughters Tiberius the Titirangi Mouse. My favourite quote for many years has been one from Ntozake Shange “I found God in myself, and I loved her I loved her fiercely”. I recently learned that Barack Obama used this quote in his 1995 Memoir Dreams From My Father. Using wert in an online Wordscraper game reminded me of the saying Bird thou never wert, probably the only memory I have of that word. I’d forgotten what came before and had to look it up to be reminded of Shelley’s To a Skylark which begins Hail to thee, blithe Spirit! Bird thou never wert. The latter line has become a peculiar way of saying You never were. Wert is itself a peculiar word these days, and does not appear in my Shorter Oxford English Dictionary except as an archaic form of the present subjunctive of be. It’s amazing how many of these ancient words linger in the subconscious until they’re needed for a word game. I’m lucky it was considered acceptable in Wordscraper. All this got me thinking about birds. Jonathan Franzen says they’re amazing. Did you know that the British Royal Society for the Protection of Birds was originally started to fight against the trade in feathers to adorn Victorian women’s hats? In the late 19th century thousands of birds were killed and marketed for their feathers, a practice decried as Murderous Millinery. In 1921, the Importation of Plumage (Prohibition) Act was passed, forbidding plumage from being imported to Britain. As I sit under the walnut tree on a warm summer day a blackbird chirps incessantly above me, but I can’t see her. Maybe she never wert. ‘What is the singing that I heard? Yesterday I enjoyed a workshop taken by Lynley Edmeades, Ursula Bethell Writer in Residence, and hosted by the Teece Museum of Classical Antiquities. Titled ‘Getting Inside with Words’ the workshop focussed on ekphrastic poetry, which is the poetic description of a pictorial or sculptural work, i.e. the verbal representation of visual representation. Probably the best known example of this is John Keats’ Ode on a Grecian Urn. After reading several examples, we went into the Museum and chose an item to write about. wondering will it ever end? ‘Poetry Life Hacks’ was the name of the WORD Festival workshop I went to with Hera Lindsay Bird. This was the first time I’d been upstairs in The Piano, where the Trinity Room looks out onto the head of the ballerina painted on the back of the Isaac Theatre Royal. Hera led us through five different exercises, all ones that she finds useful herself. We did a lot of writing in a short time, sharing what we’d written with the whole group. You could pass if you wanted to, but I enjoyed reading my pieces out loud and it was good to get a positive reaction. We’d been asked beforehand to bring a poem we disagreed with, and a short poem that we love. For the one we disagreed with (I’d chosen W.H.Auden’s “In Schrafft’s”) we were asked to write a line arguing with each line of our chosen poem, then to read out our own lines. For the poem we love (mine was “Warning” by Jenny Joseph) we had to analyse what each line was doing, then write a poem on similar lines. I found this a satisfying exercise, and might take this poem further. Other exercises involved writing lines, then reading them in the opposite order, choosing metaphors from a sheet of nouns, and writing a poem that (obliquely) answered a question. Hera stressed the importance of having a repertoire of exercises that encourage you to get something on to the page, which can be refined later. Interestingly she told us that she sometimes writes only five poems in a year. After the workshop I went to “You write funny!’ a session featuring five poets, which was stimulating and entertaining. I don’t plan to go to any other sessions this weekend, but these two were very worthwhile. The WORD prices are high for anyone on a limited income, especially with booking and credit card fees added. Plus most of the authors will be interviewed on RNZ and I can hear them then. 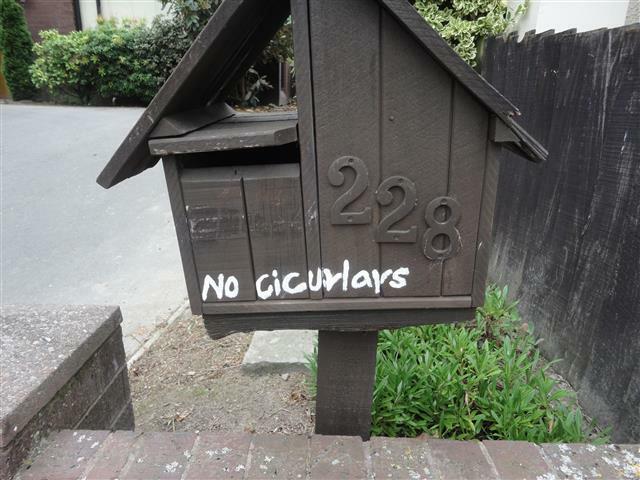 I wonder whether the person who painted this might have found Junk Mail easier to spell?